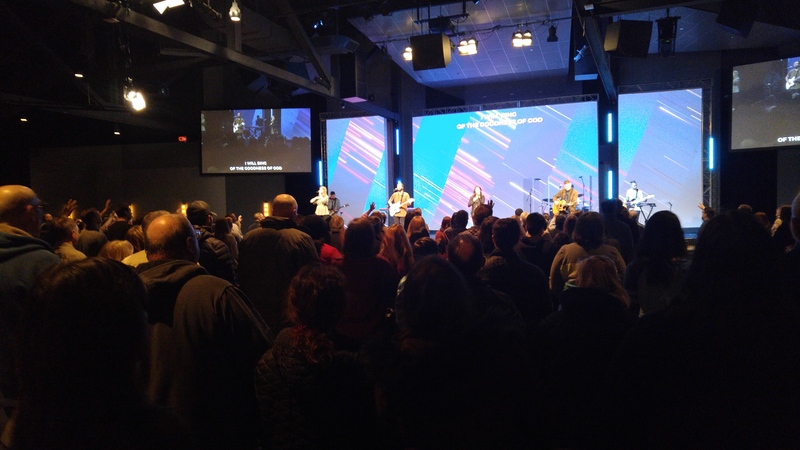 On March 9, 2019 this blog visited Harvest Bible Chapel Rolling Meadows. I was in the Chicago area and had a free Saturday and decided to take in the Harvest culture. It was a unique experience that allowed me to better understand what people were telling me. This post is just a review of experiencing Rolling Meadows. On the weekend of March 9/10, 2019 I was in the Chicago area. The reason for the trip was personal. It was to spend time with a loved one who was taking a legal education course downtown. I traveled there from Washington, D.C. to see my sister and spend time with her. It was the first time since my Dad’s death and burial a couple of months back in seeing family. However, my sister’s legal course was also all day Saturday and I had a free day to kill. What I decided to do was meet with a number of people formerly from Harvest Bible Chapel and then also to sit through a service at Rolling Meadows. When I figured out the logistic issues then I was in the Palatine, Illinois area. But why would a person go to all that effort? Quite simply its to observe, take notes, and try and understand the culture and get a feel for it. Often times it helps me in writing when I see the organization function as it historically has done so. To observe key personalities in a church or personally interact with them helps me to understand what people are saying. It also helps me to vet witnesses and as well who approach me. As I attend I keep in mind what people say and when that plays out before me it helps me to analyze the situation better. I can also take notes and then listen to something online and see how an evangelical church spins the message or edits out information. To be honest I don’t think you can write a blog like this without taking in some of these locations. And that is why when I had a free afternoon I decided to check out Harvest Bible Chapel Rolling Meadows. Going to Rolling Meadows came with concern and was one of the more tense experiences that I had. In doing my research I asked a lot of questions about it to people I know. I was told that the place was tense and that security was on alert for media and bloggers. I was also told that the leadership was on edge. When I asked about pictures I was told that could be difficult and could result in me being removed or thrown out. So having being forewarned I knew what I was up against when I attended. I decided to be more conservative than normal and not take many pictures. When I did take pictures it was mostly at the opportune times. For example during worship when people were standing. I thought this through in advance. So a few minutes before 5:00 I braced myself for an intense experience. I was about to enter into a bubble that was cut off from the world. I was also about to see a culture that people have been telling me about over the phone. In North and South Korea there is a historic bridge called “The Bridge of No Return.” In my own way I was about to cross that bridge when I walked into the large overwhelming warehouse at Rolling Meadows. I was prepared to see the propaganda at work with the “Your Are Loved” being in the area. So I finally walked in and stopped and gauged a feeling. Rolling Meadows felt very controlling. It felt apprehensive and a little suffocating. I thought to myself is this what Mars Hill Seattle felt like? I walked around and explored. The guest desks I walked past and I saw the overflow seating. 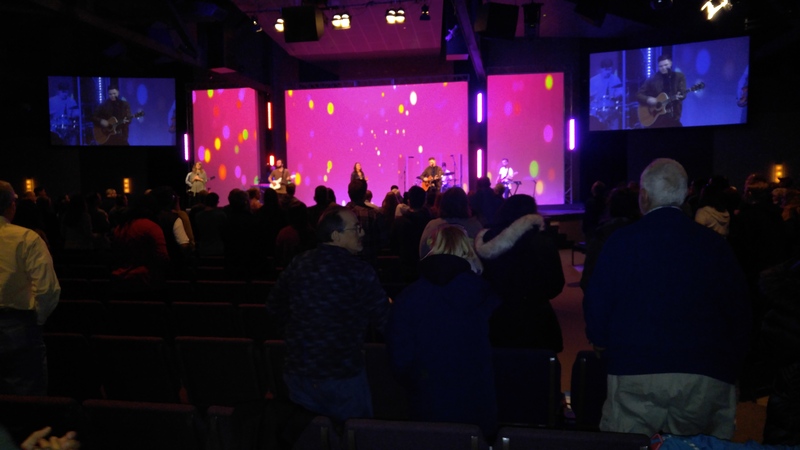 When I walked into the main worship venue I was overwhelmed by the lights, technology and more. It was probably one of the most professional settings I saw. Cameras to record the worship and cameras to record the crowd. The worship got going and was very first rate. I stood there and took my first picture which you see at the beginning of this post. I then listened to Lauren Smith stop and speak. She talked about how hard these last few weeks were and how she and everyone were caught by surprise. Her voice cracked like she was going to cry. For me it felt like an act, as if everything was scripted or planned for the maximum emotional effect. After the worship ended I shook hands with a few people and sat down. I was not prepared for what I witnessed next. It was the resignation of Steve Huston. When I realized what was about to happen I furiously took notes. A couple people clapped some support and others scream out, “We believe you Steve!” While that happened I got a picture of him reading his resignation statement. That is for another post. I also witnessed Greg Bradshaw speak about Harvest 20/20. I then listened to John Smith preach the following message. Picture I took during worship. 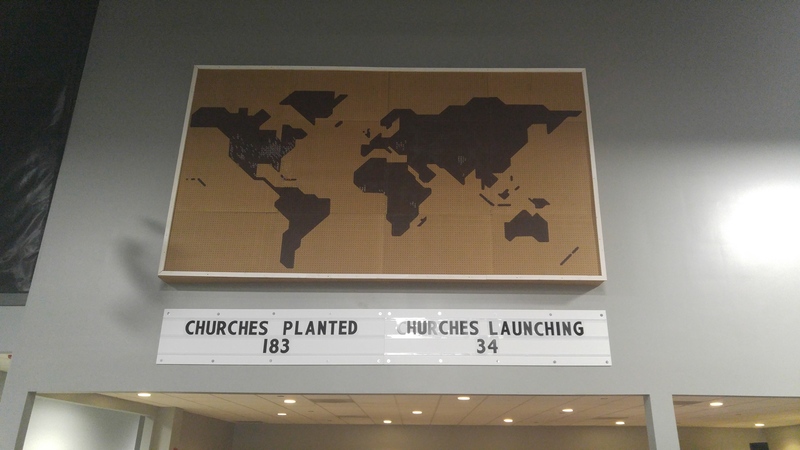 Picture of Harvest church plants above the overflow seating. I left the worship hall and briefly looked at the chapel and then decided to leave. I needed to get back to downtown Chicago to see my sister. The bookstore was at the entrance. I tried to open the door and was met by security. They told me it was closed as it was a time capsule and still had all of James MacDonald’s material. I asked about Vertical music and was told that Amazon is what people are being told to buy it off. I shook his hand and then I left. Funny thing is that I planned to take Metra back to Union Station in downtown Chicago, but when the train came in I was on the wrong side of the tracks. So after missing the train I learned how to use Uber and took that to the hotel near the Hancock Center. After attending Harvest there is one thing that sticks with me. In many ways it haunts me and I have been thinking about it. It is the same issue that Sovereign Grace dealt with that baffled me. Why would so many people go to a church even as its beset by scandal and issues? Why tithe to a questionable entity? Why would people ignore everything and all the complicit cover up and still attend? For me even if the Harvest Bible Chapel scandal did not play out I saw red flags in the culture at Rolling Meadows. There was the emotional manipulation and the incredible way everything seemed to be orchestrated. But it bothers me that people still would attend given the issues that exist. That is hard to comprehend and I find myself asking that very question regularly. We still go because the people there are family and we love them, they ar Godly people who are the body of Christ. The church is infinitely more than James and his issues. When I worked in Arlington Heights, and then in Hoffman Estates with At&t back in the late 90s and early 2000s, the Harvest book store was my safe haven on my lunch hour. I could see Willow Creek from my office in Hoffman, but that was more like a mall. lol. I only have good memories of service at Rolling Meadows, and the few times I went to Crystal Lake at the High School before they got a building. I agree with the above comment in a way. People will still come for the message and the fellowship. I do think they should hold tithes at this point until the books are clear what they are doing with the $$$ How fast would they show transparency if they still had a church full of people, that weren’t giving! I ask myself the same question over and over – Why do people continue to stay and support and vote for more and more abusive/controlling leadership and conditions? How do people become so mesmerized by the charismatic leader so that they are blinded and willing to do most anything. The church we left is now proposing constitution changes that allow discipline for being “threatening to the testimony of the church” or being “divisive to the body”; both very vague nebulous wide-open in interpretation statements. I do understand the need to been with friends and the loyalty that generates. We did that too but in doing so we compromised our convictions and eventually couldn’t live with that. How do people become so mesmerized by the charismatic leader so that they are blinded and willing to do most anything? The Chinese term is “Threatening Social Harmony”. Ask any Chinese Government Censor. It’s especially troubling for a denomination that’s supposed to allow for theological freedom. I wouldn’t be a bit surprised if that’s because the leadership didn’t like their Calvinism being threatened, especially by a woman, and want to nip it in the bud…. I’m almost done reading your book, BTW. Last night, because of this post, I went over to the website of my long-ago church to re-read some stuff they had there. I also found a page describing their 2017 protest of an inter-denominational hymn sing celebrating the Reformation. I don’t know how I missed the page before, but it proved that I understood correctly that they were protesting because they didn’t like Catholics fellowshipping with Protestants. I was reassured that despite the pain, we were right to leave there 15 years ago–before we drank the Kool-Aid. A document on the site describing their views on leadership had a lot about “submitting,” that women should not be elders/on the board, shepherding… Even my *Orthodox* parish doesn’t have such strict rules about church leadership, and if it did, we’d never have enough people on the board! Women have lots of important leadership roles in my church: Bible reading in services, parish president/treasurer/etc., festival chairpeople, etc. If the 2000-year-old Orthodox church can be okay with this, why is it so anathema for the EFCA? Of course, the Orthodox church is like the Catholic one in keeping women out of the priesthood and higher, but below there’s more freedom. When we left the EFCA church 15 years ago, I don’t recall it being tilted too far toward extremism–yet. But looking over that document, I’m pretty sure they’ve moved toward the male-dominant and authoritarian pattern that was taking over your church right before you left, Amanda. “So a few minutes before 5:00 I braced myself for an intense experience. I was about to enter into a bubble that was cut off from the world. I was also about to see a culture that people have been telling me about over the phone. In North and South Korea there is a historic bridge called “The Bridge of No Return.” In my own way I was about to cross that bridge when I walked into the large overwhelming warehouse at Rolling Meadows. I was prepared to see the propaganda at work with the “Your Are Loved” being in the area. You have to be educated and intelligent enough to know that what this reflects is precisely what you brought in with you. When I walked into Harvest Rolling Meadows in past years, it felt like a bright, pleasant, welcoming place. You emotionally primed yourself to be uncomfortable and wary. Right now, I imagine things really are pretty somber. I fully accept that while I attended Harvest, things were growing increasingly toxic and I was being misled by staff who either had been lied to themselves or felt compelled to uphold an inaccurate narrative. While I left before the wheels really started coming off, I accept that tithes I gave in trust were wastefully used. I believe James is disqualified, and I will not be listening to any of his preaching in the future unless he addresses his sins and failures. Probably not even then, because while I can forgive him, I do not trust him. There’s no Kool-Aid stain on my face. That said, visiting Harvest for one service, especially now, will not tell you anything about why a core of the church is still there or what their trajectory and experience has been. The thing that some people (including you) do not seem to grasp is that except for a small circle of those who actually saw how the sausage was made or worked with James, there was no culture of fear and intimidation. For the vast majority of the church, whatever drama was going on in the leadership tier had no more direct bearing on what they were doing and experiencing and learning than the politics of a diocese have to do with a parish. The church is that large, with various internal spheres. There were many churches and communities within the Harvest megachurch environment, and the Harvest I attended and the people I did life with were amazing… to this day, some of the most dedicated, mature, wonderful Christians I know. Calling Harvest a cult, insisting that anyone who is still there has no discernment, making broad generalizations about megachurches as if they are all toxic, acting like no genuine ministry happens there and that all it ever amounted to was misplaced worship of personality… those things may be true in some ways for some people. I’m heartbroken for them, and I hope they have learned something. But it is grossly ignorant to attempt to make that the entire picture, and those who do so can expect to continue in their stubborn perplexity. They simply don’t know what they are talking about. They don’t even know what they don’t know. Additionally, I do not believe that you are responsible enough, discerning enough, or careful enough to operate a blog of this nature, as you have posted and continue to host accusations, gossip, and inaccuracies which would be an embarrassment to a genuine journalist and are laughable to those who know the facts (or, who just have some common sense about what should or should not be said by those trying to report on a football game by looking through a keyhole). Based on what I have read here, I believe you should find a new preoccupation which better matches your skills and talents. Well thank you for the kind words. You are free to speak your mind and say what you want. I have visited quite a few churches and it helps to see people in their environment. The Kool Aid is strong at Harvest, plus it also validates the theory Mark Noll had about the scandal of the evangelical mind. If evangelicals practiced discernment places like Harvest would not exist.